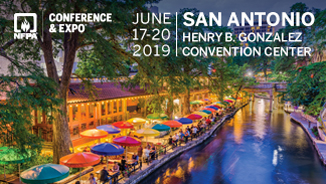 Register Now for the 2019 NFPA Conference & Expo, in June, in San Antonio! WHAT WE DO IN SAN ANTONIO MAKES A DIFFERENCE IN EVERY CORNER OF THE WORLD. Come see what's next for us! The NFPA Conference & Expo® is an essential experience for any fire, electrical, and life safety professional. It's an opportunity to get together as experts and learn more about the latest challenges around the world and the cutting-edge solutions to deal with them. Hear from dozens of world-class speakers; visit with hundreds of exhibitors and explore the latest products and techonologies; share expertise and connect with a global network of colleagues, and more.